Thai cook fries chicken burning-hot oil with his completely bare hands. 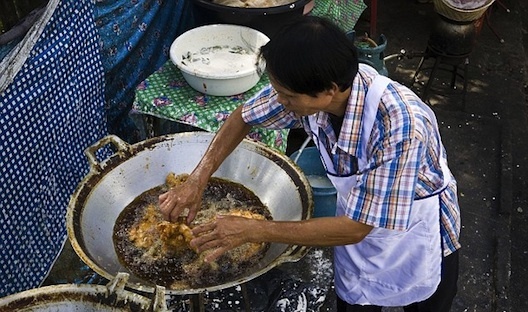 Unbelievable but true, the 50-year-old Chiang Mai-based street cook can sink his fingers into 480 degrees hot grease without getting so much as a blister on his hands, and his amazing ability has won him international fame. 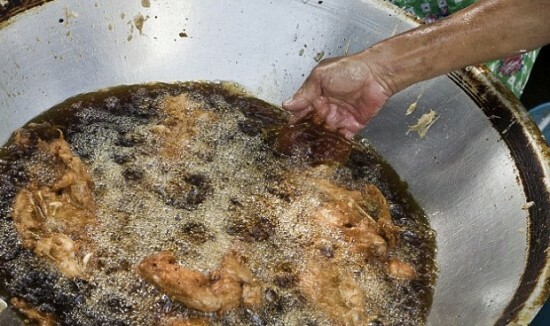 People from all over the world come to his “Fried Chicken Iron Hands Man” food stall to see Kann use his hands to scoop out the chicken and he and his wife travel the globe showing off his gift. Superhands has no idea why he can do what he does, but he’s just happy it brings more and more customers for his business, every day. Kann Who really is a super human, got the title of “Superhands” Trichan. He got this cool nickname for his incredible ability of scooping pieces of chicken and beef from burning-hot oil with his completely bare hands. Kann Trichan also holds the Guinness Record for picking 20 pieces of chicken from oil heated to 480 degrees Celsisus, in just one minute. He says he can feel the oil is hot when he dips his hands in it, but it simply leaves no mark. Scientists have yet to unravel this peculiar gift.